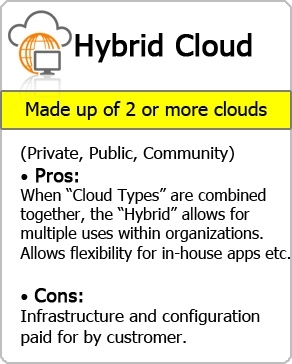 The Hybrid Cloud Model is exactly what the name indicates. It is the combination of two or more cloud solutions that a client subscribes to (Private, Community or Public). These services are not co-mingled, instead they exist and function independently of one another, yet are bound together to offer a complete solution for the client. The primary benefit of this model is the functionality of services available to clients, such as multiple deployment models. Cloud subscribers can benefit from this “Hybrid”architecture regarding FAULT TOLERANCE and USABILITY.What this means is that this menu of services. with locally immediate usability without dependency on internet connectivity. Hybrid Cloud architecture requires both on-premises resources and off-site (remote) server based cloud infrastructure. Hybrid clouds lack the flexibility, security and certainty of in-house applications. Hybrid cloud provides the flexibility of in house applications with the fault tolerance and scalability of cloud based services. The Hybrid Cloud may since be a 200 User Hosted Mail Exchange Solution combined with an Application Development Solution for the program development team to design and test a new product.